For those of you who visited the ISML forum board but had trouble with posting, I have fixed the problem, so you should post there without any problem. EDIT: Yuki Nagato's profile is finished, and her individual schedule is released. And personally, I apologize to Yuki for giving her tough matches early. Shown here. 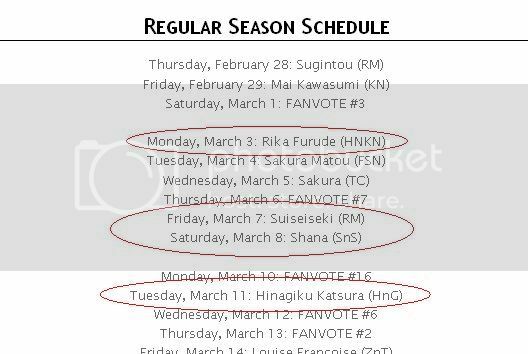 Just so you know, if an individual contestant's schedule is released, you can always find out who she's going against and when by checking the schedules page. Last edited by minhtam1638; 2008-01-14 at 22:55. 1 point: Asa Shigure- Shuffle! I should remind myself to put Evangeline, Mikuru, and Kagami in alphastickmania's next image batch. Hey, it's been only three days, and so far, I have nearly 150 characters on my list vying for only 17 positions. It's one heated race. So far, three of them have left the rest in the dust, so they're in safe haven (for now), but what's more important is that 17th slot, and I see a huge stack of competitors vying for it. I'm telling you, a lot of these girls will be going home disappointed. Last edited by minhtam1638; 2008-01-15 at 02:07. 10 bux say that at least one of them, if not the three, are from Clannad. And I bet these KyoAni fans forgot about Air. The difference of hype. Also one of them could be Sakura. That makes me ask, is it really fair to have both of them? 90% of people will find Sakura-chan more moe than Sakura-hime. Here's my take on KyoAni fans and Air: Air was the first KyoAni production, so it was kind of a prototype to where everyone goes. KyoAni used Air and improved on it for Kanon, so typically, Kanon girls are more moe than Air girls. And now Clannad is overshadowing Kanon in terms of moe. If you look at it from 2005's Saimoe Japan statistics, Air didn't really do so well - just one girl finished in the top 16 (Kannabi no Mikoto, 8th place), and there weren't as huge as a faction then, so generally speaking, many KyoAni fans won't remember Air at all. I don't think KyoAni became a huge threat until Haruhi Suzumiya came by. And as for the Sakura situation, unlike little Nanoha and big Nanoha, Sakura-chan and Sakura-hime are from two different series that have little to do with each other than the fact that the same names were used, so I am treating them as separate. Also, Sakura-chan participating in this tournament may be a plus to Sakura-hime, since although Sakura-hime will probably blow the match against Sakura-chan, there may be some sort of an alliance that can pull her through with a better finish than projected. I so wish I can spoil the results as of today, but I can't, since a leak in information will result in changes in voting patterns, kind of like what happened in Saimoe Japan 2007. I can only be cryptic in these kinds of things. Hello everyone...I'm Italian boy...pleasure to meet you! I voted this name...is correct??? ehehe...I hope that Ren will pass the turn ehhee!! Edited my first post to include a third rule... I knew I forgot something. Kagami Hiiragi and Mikuru Asahina are dead nominations, since both characters have already qualified in this tournament via a top 16 finish in the Korea tournaments. I'm looking at the nomination results right now, so if you re-submit with the same IP address, I'll fill in the 4 and 3 points for you. Eh... You can vote for characters on H-series?!? Personally, I think characters that live in the H arena only don't stand much of a chance. P.S : minhtam2448, have you tried DarkMirage? Not totally correct (though one might argue Air is the "first" because it is their first stand alone production). There is Full Metal Panic? Fumoffu and some other projects before IIRC. And as for the Sakura situation, unlike little Nanoha and big Nanoha, Sakura-chan and Sakura-hime are from two different series that have little to do with each other than the fact that the same names were used, so I am treating them as separate. As a CLAMP fan, I seconds it a lot, because even though both Sakura are kinda similar, they are definitely different, and it has nothing to do with the plot part of "dimension" nor the age. They are acting and their mindset are quite different, although their harbor the same assets and personality traits. 5 & 4: Might be a little bias considering they are my favourite CLANNAD female characters, but simply, Nagisa screams "moe" for me, considering he assets, personality and hardship/actions. Kyou, meanwhile, is the kind of genki & aggressive girl which is quite well blended with her assets and careness. 2: I don't think I need to give justification for the widely infamous Sakura-chan, one of the earliest and foundators of "Moe". 1: Despite Kaname is my favourite character along with Sousuke, Tessa deserves the "moe" title in the franchise. Klashikari, Tessa has already qualified. So you can still nominate Chidori. Or whoever else you want. alphastickmania, I personally find Fujino Shion (Hatsu Inu) really cute, despite my general dislike for silent girls. And Minhtam, I think that Sakura-hime's performance will decrease due to Sakura-chan's presence. Since she might have gathered a few extra votes just for having the name. Well i guess it will go for lazyness and vote for Kaname then. 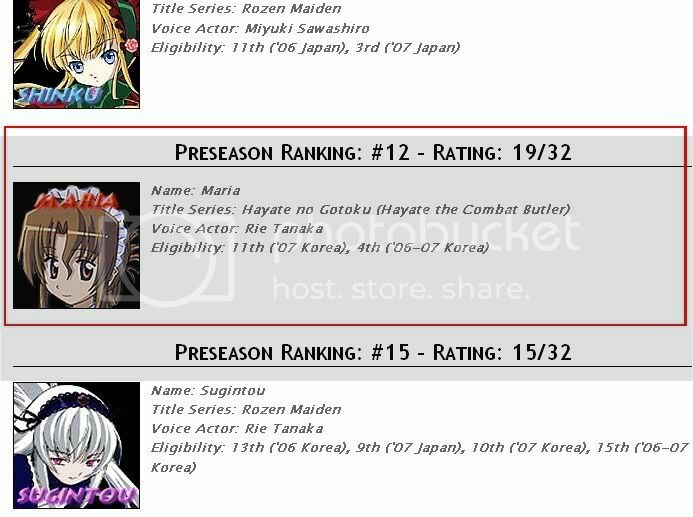 And technically, you can nominate characters from H-series, since they are technically listed under anime, but if you think about it, they're NOT going to do well in this league - Saimoe contests tend to bend toward the younger. Not to mention that most of their support material would be censored due to the rules I listed. EDIT: Can't accept Night Shift Nurses girls - profile check gave me way too little information on them. Last edited by minhtam1638; 2008-01-15 at 11:35. I could rightfully be accused of taking the chalk with my own nominations, but I'm nonetheless pleased to see a good selection in the thread so far. Even though some of the named characters inevitably won't end up making the field, seeing their names kind of triggers a memory of encountering them for the first time. Good stuff. Was really hard to narrow it down so much . But here is my 5. Tama-chan because she's like a younger shy otaku version of Mai. Holo because 1 episode tells me that I'm going to love her mischevious but injured personality. Chaiki because she's just plain awesomeness in how she deals with Kana and Mako-chan. Sora because I love her inquisitive and peaceful but shy nature. Kana because she's so crazy and energetic and silly. Last edited by Ultenth; 2008-01-16 at 03:13.